Download "Outlook for Australian Property Markets 2010-2012. 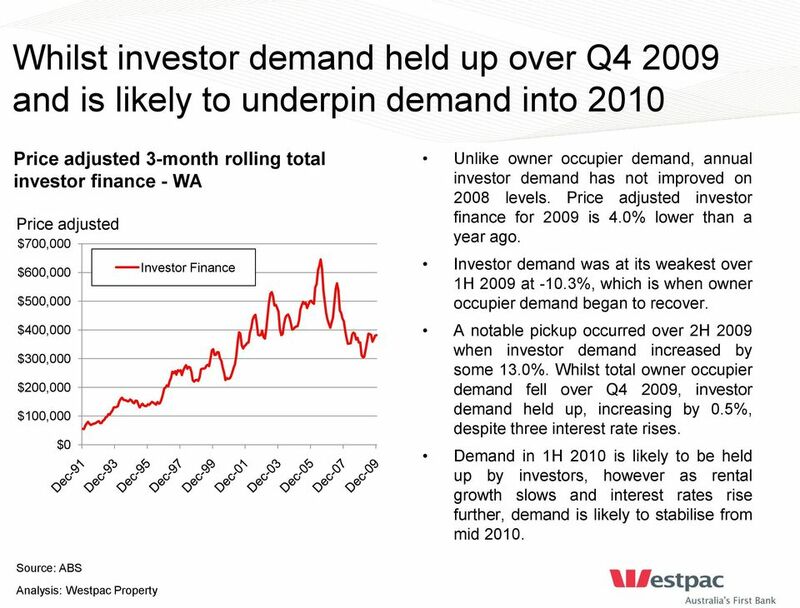 Perth"
4 Owner occupier demand is up on 2008 levels however began to slow over Q month rolling totals - housing finance for owner occupiers - WA Existing 18,000 16,000 14,000 12,000 10,000 8,000 6,000 4,000 2,000 0 Source: ABS Analysis: Westpac Property Existing Dwellings New Dwellings New and Construct 6,000 5,000 4,000 3,000 2,000 1,000 - Overall owner occupier demand levels have improved over the year, increasing by some 22.1%. Demand to purchase or build a new dwelling was the driver, which increased by 55.5% annually. Demand to purchase an existing home also improved, albeit to a lesser extent than new homes, growing by 12.4% annually. Owner occupier demand was largely driven by first home buyers (FHBs) for the most part of However, the number of FHB approved for housing finance dipped in Q4, falling by 9.0% as the FHB boost was phased out. Non FHB demand stabilised over Q4, with growth of just 0.4% recorded. However, overall demand fell by 2.8% over Q4. 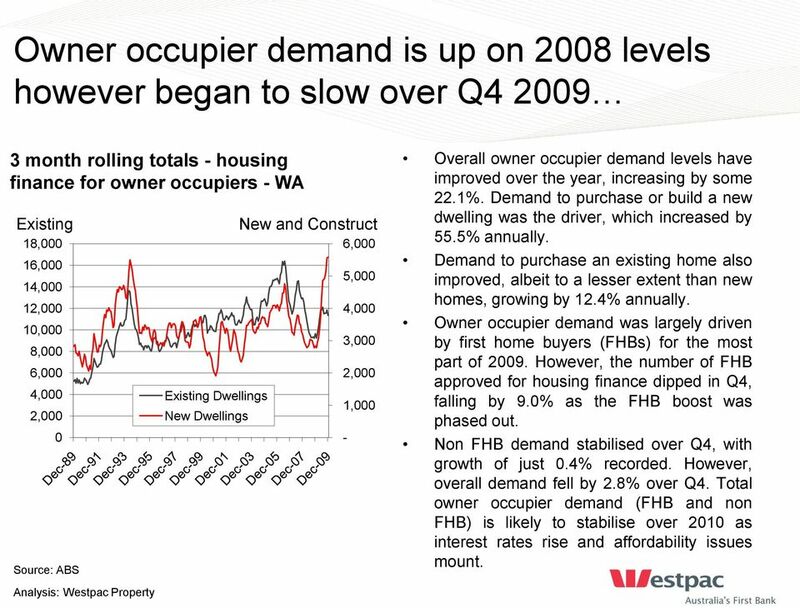 Total owner occupier demand (FHB and non FHB) is likely to stabilise over 2010 as interest rates rise and affordability issues mount. 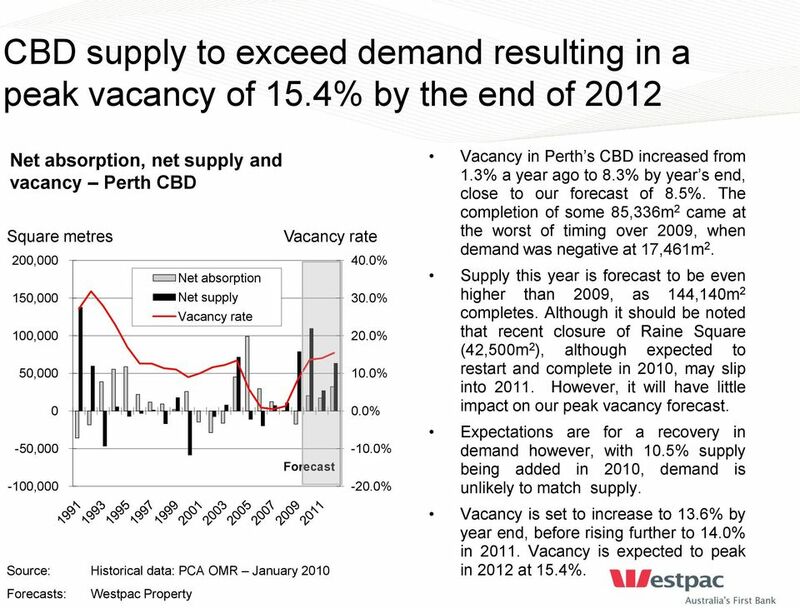 12 CBD supply to exceed demand resulting in a peak vacancy of 15.4% by the end of 2012 Net absorption, net supply and vacancy Perth CBD Square metres 200, , ,000 50, , ,000 Source: Historical data: PCA OMR January 2010 Forecasts: Westpac Property Net absorption Net supply Vacancy rate Vacancy rate Forecast 40.0% 30.0% 20.0% 10.0% 0.0% -10.0% -20.0% Vacancy in Perth s CBD increased from 1.3% a year ago to 8.3% by year s end, close to our forecast of 8.5%. 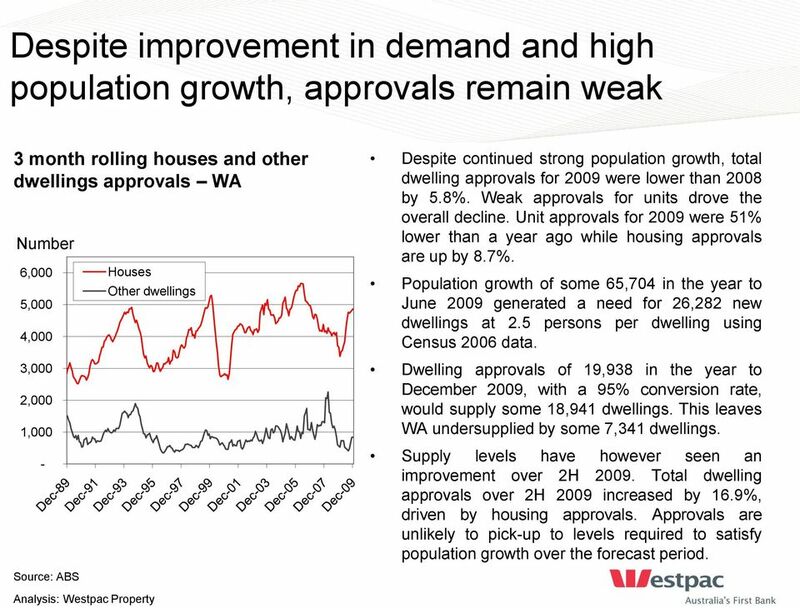 The completion of some 85,336m 2 came at the worst of timing over 2009, when demand was negative at 17,461m 2. 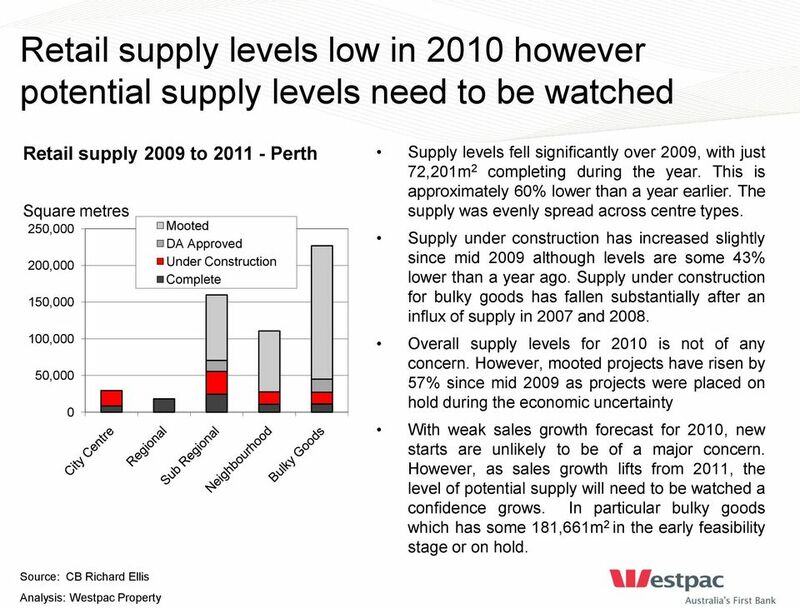 Supply this year is forecast to be even higher than 2009, as 144,140m 2 completes. Although it should be noted that recent closure of Raine Square (42,500m 2 ), although expected to restart and complete in 2010, may slip into However, it will have little impact on our peak vacancy forecast. Expectations are for a recovery in demand however, with 10.5% supply being added in 2010, demand is unlikely to match supply. 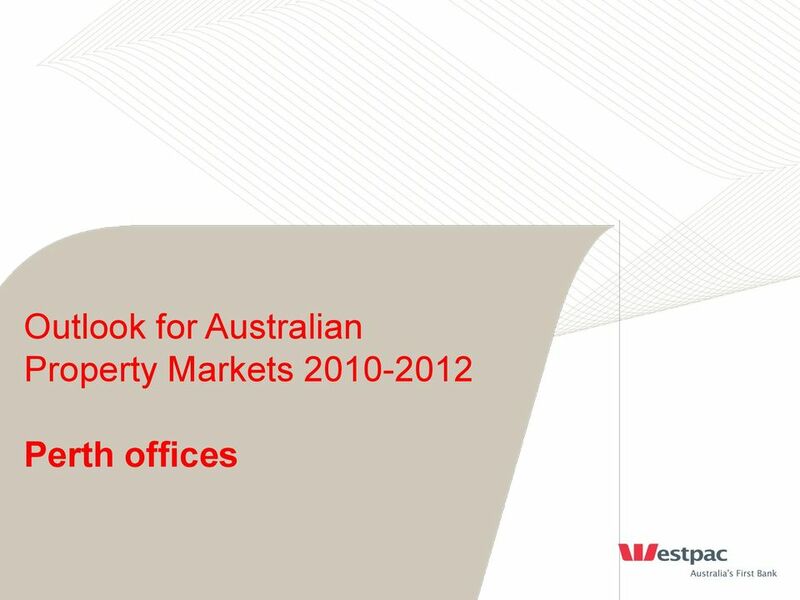 Vacancy is set to increase to 13.6% by year end, before rising further to 14.0% in Vacancy is expected to peak in 2012 at 15.4%. 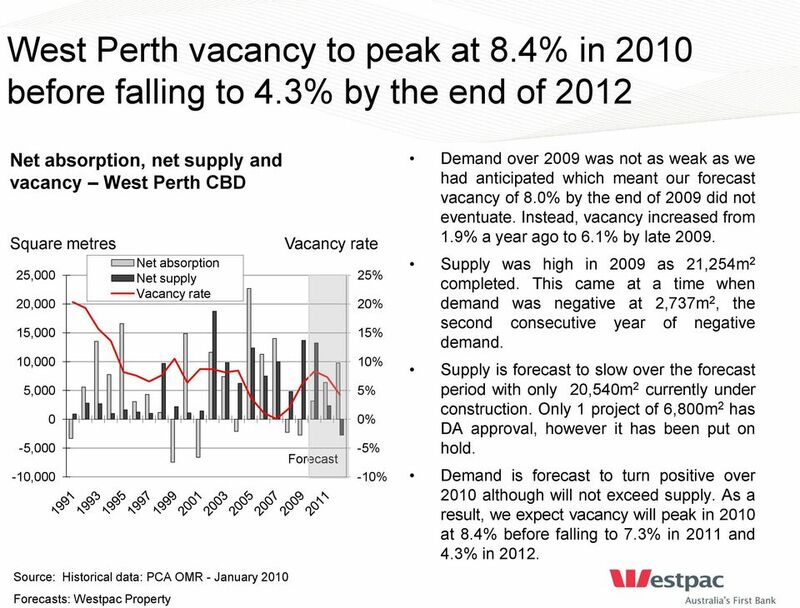 13 West Perth vacancy to peak at 8.4% in 2010 before falling to 4.3% by the end of 2012 Net absorption, net supply and vacancy West Perth CBD Square metres 25,000 20,000 15,000 10,000 5, ,000-10,000 Net absorption Net supply Vacancy rate Source: Historical data: PCA OMR - January 2010 Forecasts: Westpac Property Vacancy rate Forecast 25% 20% 15% 10% 5% 0% -5% -10% Demand over 2009 was not as weak as we had anticipated which meant our forecast vacancy of 8.0% by the end of 2009 did not eventuate. 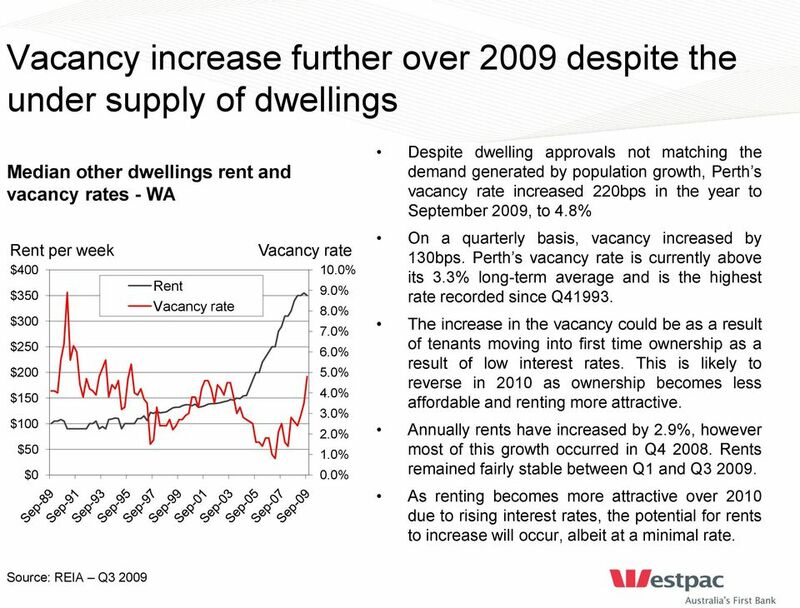 Instead, vacancy increased from 1.9% a year ago to 6.1% by late Supply was high in 2009 as 21,254m 2 completed. This came at a time when demand was negative at 2,737m 2, the second consecutive year of negative demand. Supply is forecast to slow over the forecast period with only 20,540m 2 currently under construction. Only 1 project of 6,800m 2 has DA approval, however it has been put on hold. 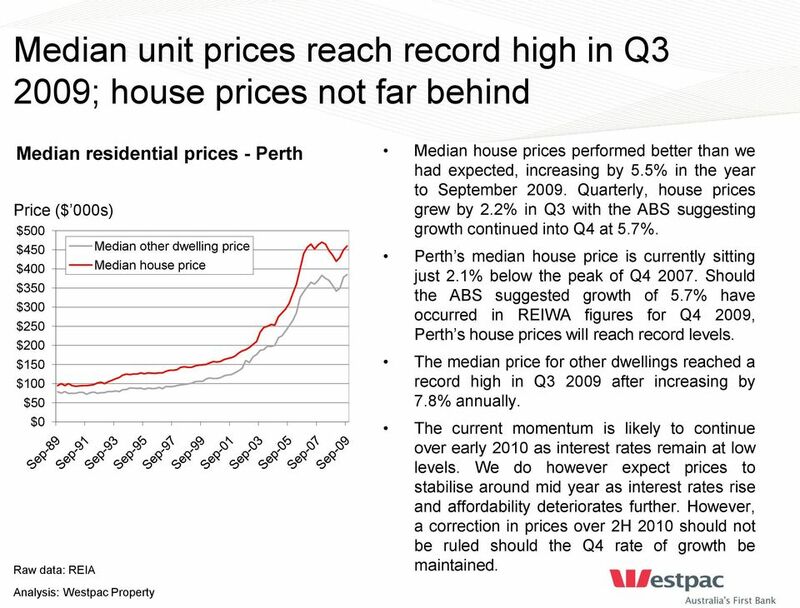 Demand is forecast to turn positive over 2010 although will not exceed supply. 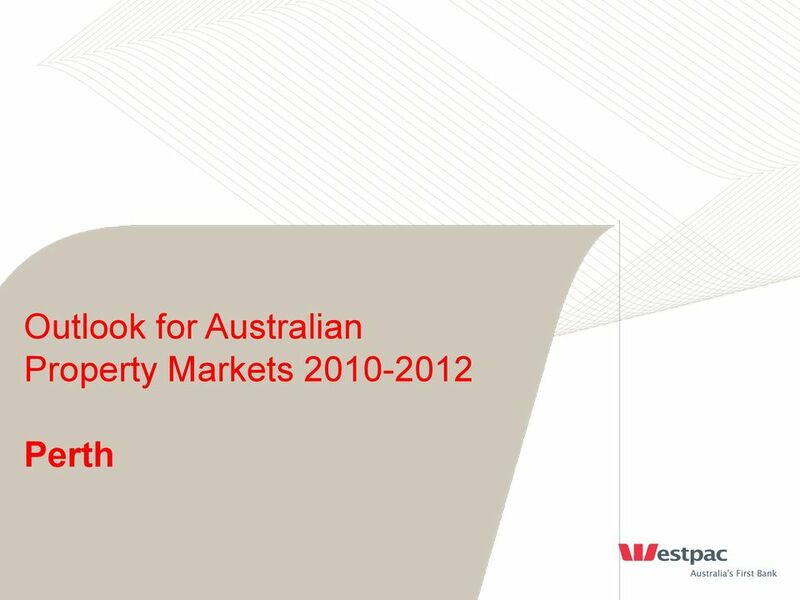 As a result, we expect vacancy will peak in 2010 at 8.4% before falling to 7.3% in 2011 and 4.3% in 2012. 15 The easing cycle appears to be over yields expected to stabilise over 2010 Office yields and 10 year bond rate Perth CBD Yield 11.00% 10.00% 9.00% 8.00% 7.00% 6.00% 5.00% Source: CB Richard Ellis & RBA Dec-07 Current (Dec 2009) 10-year average Yields continued to ease over 2009, however the rate of easing has slowed significantly in comparison to Office yields in Perth are now all above their 10-year averages by between 40bps in West Perth and 155bps in secondary CBD. 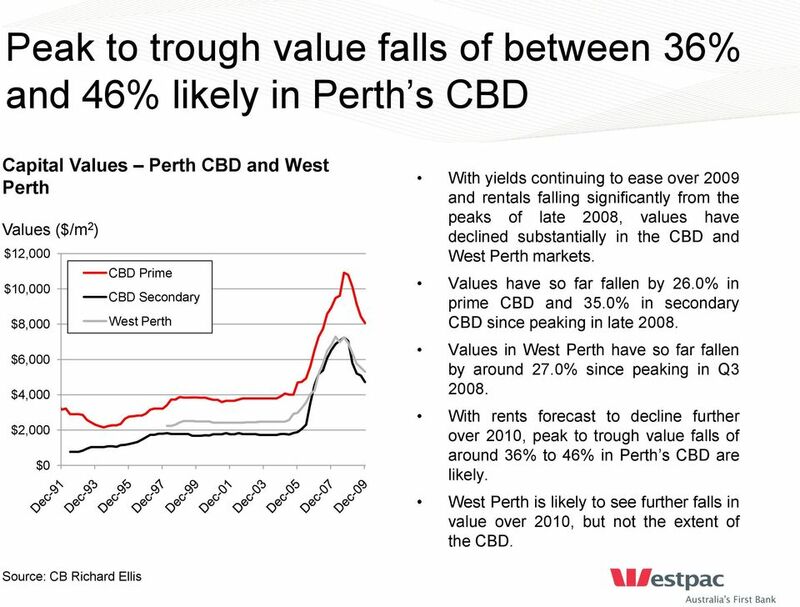 Over 2009, prime CBD yields eased by 55bps whilst secondary CBD eased by 50bps and West Perth yields by 12bps. 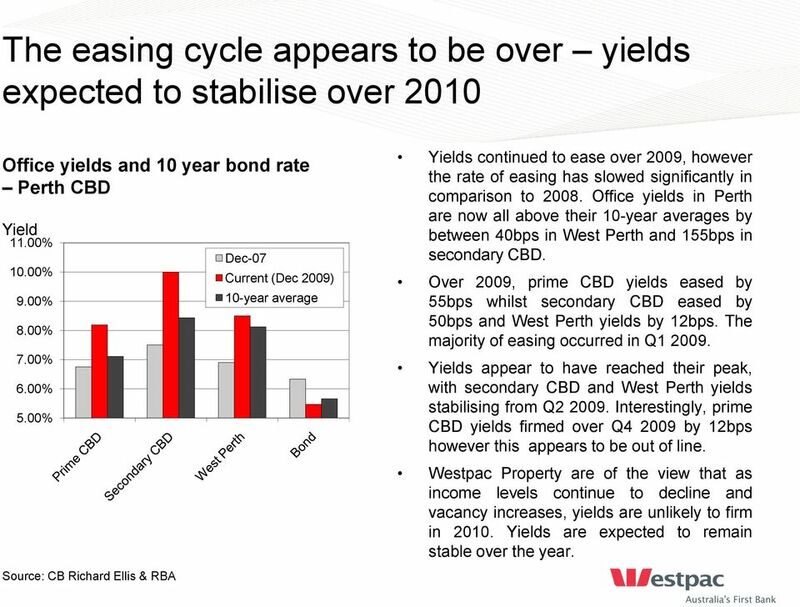 The majority of easing occurred in Q Yields appear to have reached their peak, with secondary CBD and West Perth yields stabilising from Q Interestingly, prime CBD yields firmed over Q by 12bps however this appears to be out of line. 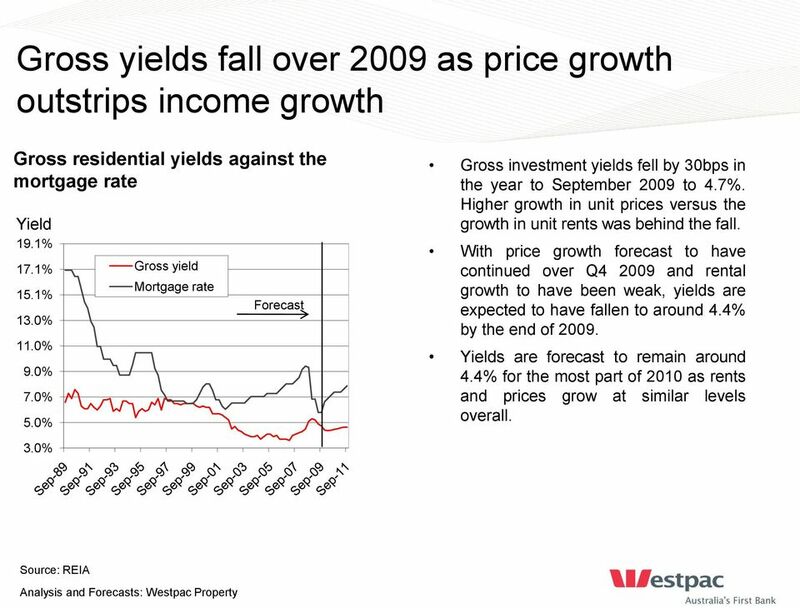 Westpac Property are of the view that as income levels continue to decline and vacancy increases, yields are unlikely to firm in Yields are expected to remain stable over the year. 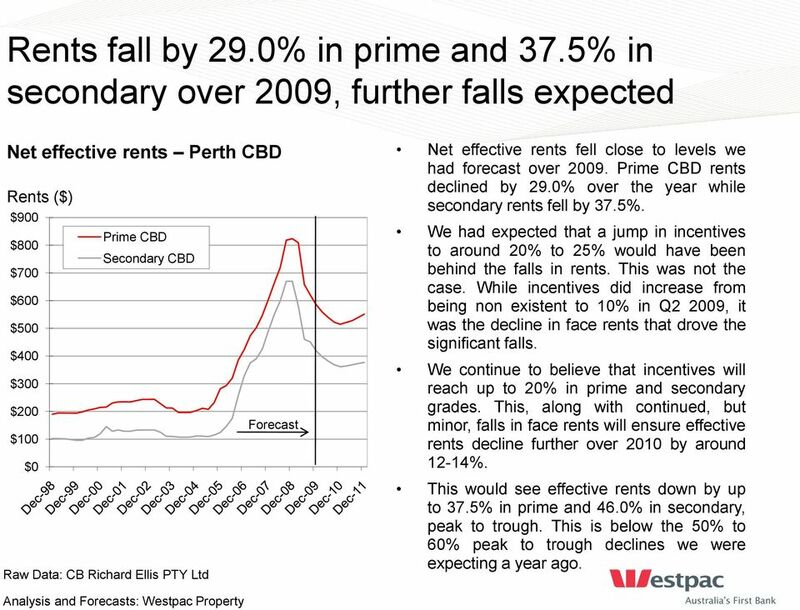 20 Retail rents recover in 2H09 however strong growth unlikely to occur until 2011 Retail net effective rental growth Perth Growth 20.0% 15.0% 10.0% 5.0% 0.0% -5.0% -10.0% Source: CB Richard Ellis Analysis: Westpac Property Prime CBD Regional Sub regional Neighbourhood Bulky Goods 1H H H H 2009 With the exception of regional centres, retail net effective rents declined over 2009 by between 6.2% in neighbourhood centres and 8.4% in Prime CBD centres. 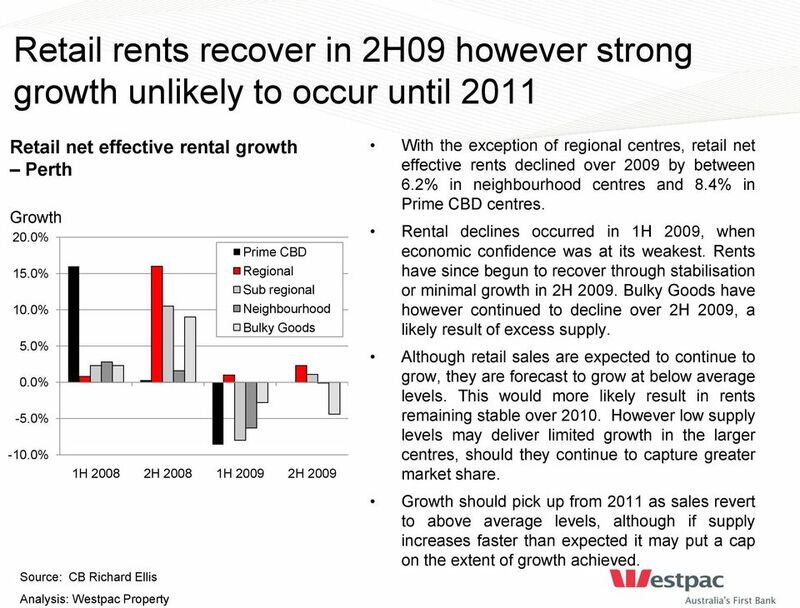 Rental declines occurred in 1H 2009, when economic confidence was at its weakest. Rents have since begun to recover through stabilisation or minimal growth in 2H Bulky Goods have however continued to decline over 2H 2009, a likely result of excess supply. 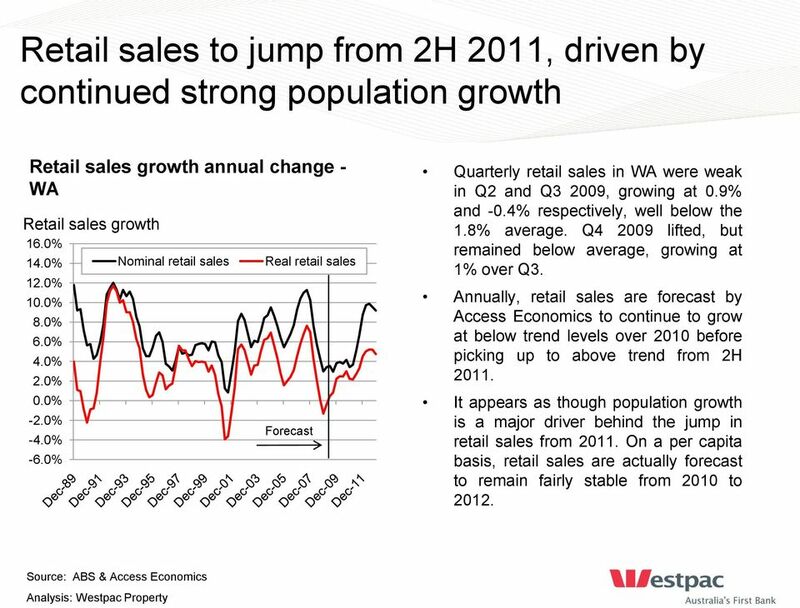 Although retail sales are expected to continue to grow, they are forecast to grow at below average levels. This would more likely result in rents remaining stable over However low supply levels may deliver limited growth in the larger centres, should they continue to capture greater market share. Growth should pick up from 2011 as sales revert to above average levels, although if supply increases faster than expected it may put a cap on the extent of growth achieved. 29 Disclaimer Past performance is not a reliable indicator of future performance. The forecasts given in this document are predictive in character. Whilst every effort has been taken to ensure that the assumptions on which the forecasts are based are reasonable, the forecasts may be affected by incorrect assumptions or by known or unknown risks and uncertainties. The ultimate outcomes may differ substantially from these forecasts. Information current as at February This information has been prepared without taking account of your objectives, financial situation or needs. Because of this you should, before acting on this information, consider its appropriateness, having regard to your objectives, financial situation or needs. The information may contain material provided directly by third parties, and while such material is published with permission, Westpac Banking Corporation (ABN ) ("Westpac") accepts no responsibility for the accuracy or completeness of any such material. Except where contrary to law, Westpac intends by this notice to exclude liability for the information. The information is subject to change without notice and Westpac is under no obligation to update the information or correct any inaccuracy which may become apparent at a later date. Westpac Banking Corporation is regulated for the conduct of investment business in the United Kingdom by the Financial Services Authority. If you wish to be removed from our mailing list please send an to 2010 Westpac Banking Corporation. CB Richard Ellis Ltd (CBRE) does not warrant the accuracy or completeness of the information in this publication, including any information sourced from CBRE, and CBRE accepts no, and disclaims all, liability for any loss or damage whether occasioned by reliance on such information or otherwise. 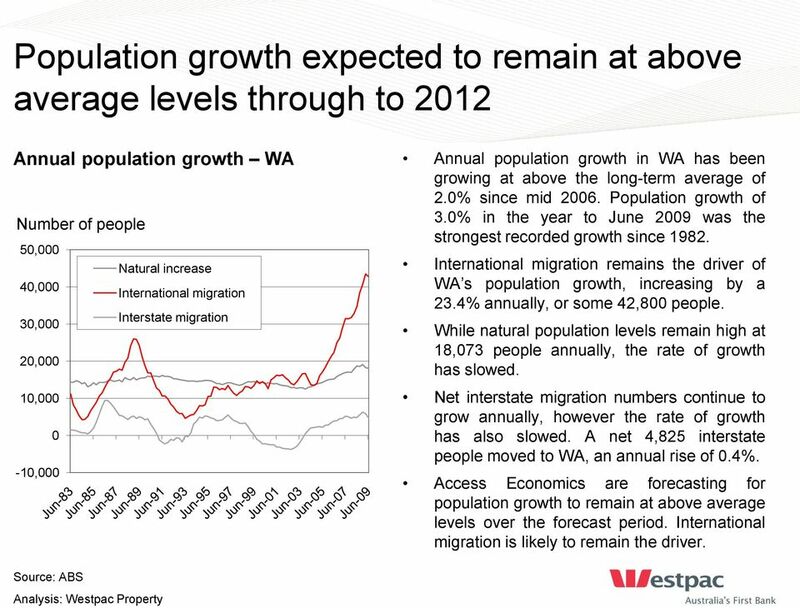 Population growth in WA has slowed from 88,000 per year in 2012 to 31,000 in 2015. This document has been published by the Housing Industry and Forecasting Group. The Australian Property Institute Inc. Australian Property Directions urvey AY 2013 T his is the 30th API Australian Property Directions urvey conducted by the Australian Property Institute (NW Division). 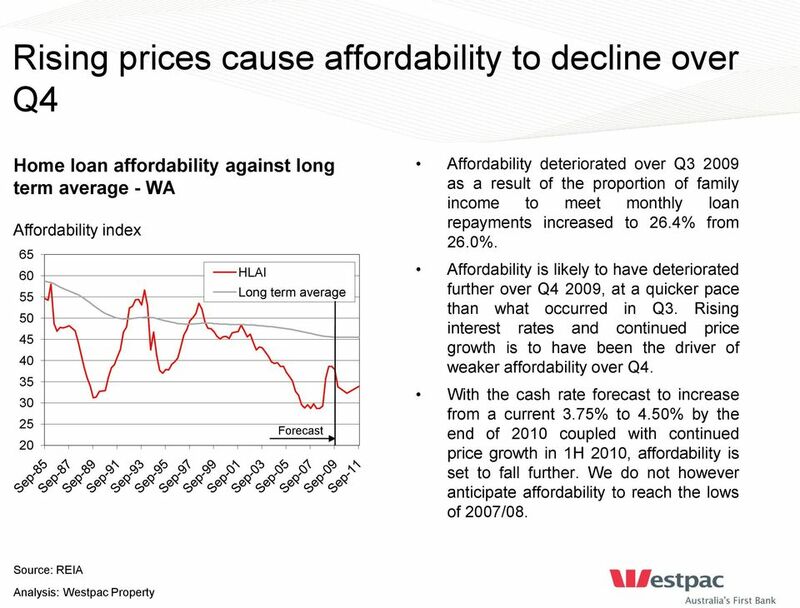 This document has been published by the Housing Industry Forecasting Group. SA Economic Outlook Summary The South Australian economy is facing challenging economic conditions. Economic growth will likely remain modest over the coming year, but there is prospect for improvement.